I have natural hair! And you know what else? It gets dry. Like REALLY DRY! Like Spongebob and friends on dry land or Sandy's treehouse, dry. Got the picture? Good. So that's why when I heard about the Castor Oil Treatment on youtube, I decided to try it myself. And it didn't disappoint. While I still despise the scent of Castor Oil, my hair was so much softer in the end, and definitely not dry. 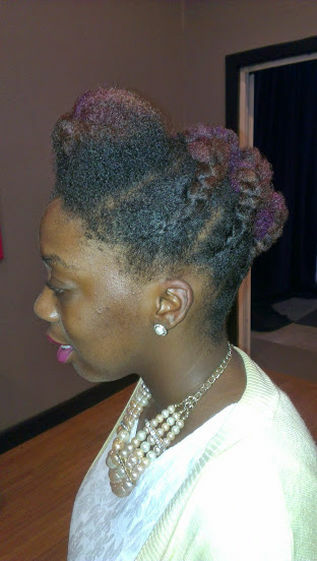 So stick with me during this picture tutorial to learn how you can do this to create luscious locs of your own. I used Sunny Isle Jamaican Black Castor Oil for this and I suggest you do the same, because it is pure Jamaican Black Castor Oil, no additives, nothing. For this project, you will need the black castor oil, an applicator bottle, a bowl, a towel, conditioner, and an additive of your choice for moisture. I used Glycerin. You can either buy an applicator bottle, or repurpose an old one. I repurposed an old one. Make sure you wash the old bottle out thoroughly. The first ingredient I added to my bottle was the Jamaican Black Castor Oil, which has a very thick consistency. After that, it's optional to add as many ingredients as you want to, but I preferred to keep it simple. I only added the glycerin because I found it's great for moisture for my hair. My hair is colour treated and most products, I've found dry out my hair even more. So I would suggest that you use what works for your hair. Carefully pour boiling hot water into your bowl, then place your bottle inside of it. This will melt down the consistency. Leave it in for about 3-5 minutes. (My bottle melted a little under the pressure from the heat, so really monitor that time). This mixture must be used on wet hair only so now we're going to co-wash. Using your favourite conditioner, wash your hair, then rinse, and squeeze out any excess water with your towel (you don't want a wet floor, accidents happen). I used Garnier Frutics Length and Strength Conditioner. With the help of my best friend Amanda (who is leaving to go back to Texas soon, so I had to put her to work while I still could), we sectioned my hair into four rows, and two columns (roughly, some rows ended up making more columns because of the thickness, but do whatever you want). We then applied the hot oil treatment to the sections as we worked through, detangling and then doing big, chunky two-strand twists (it's easier to loose when it's time to rinse this out). When you're done, wrap your hair in a plastic shower cap and find something incredibly useless to do for the next 30 minutes. For me, that was watching, "Keeping Up Appearances", a very old British comedy show that I usually watch with my mum. Rinse the castor oil treatment out thoroughly and apply your favourite leave in. Now you can either rock it just like this, or style it however you want. I prefer to style while wet. My current hairstyle was inspired by Pinterest of course! So will you try this on your hair? What are you favourite products and treatments to use on your natural hair? Sound off in the comment section below, and don't forget to subscribe for more awesomeness in your inbox!